Amsterdam, Netherlands, February 2019…At ISE 2019, TASCAM will be showing a brand new range of innovative AV products for system integrators and installers, aimed at education, corporate/industrial users and governmental institutions. TASCAM’s move into fully AV enabled solutions builds on the solid, ultra-reliable workhorse products for professionals that TASCAM is renowned for producing. Our focus is on providing solutions rather than just products and at ISE 2019 we are inviting AV Integrators, Distributors and Consultants to meet our team on the booth to discover why they should be working with TASCAM AV solutions. We will also be showing several key products from our existing product range, including the Model 24 Recorder/Mixer, the ML-16D/ML-32D Dante/AES67 multi-channel audio interfaces, the MZ-223/MZ-372 Zone Mixers, plus the Dante/AES67 enabled stereo SS-R250N and 64 channel DA-6400 audio recorder/players. 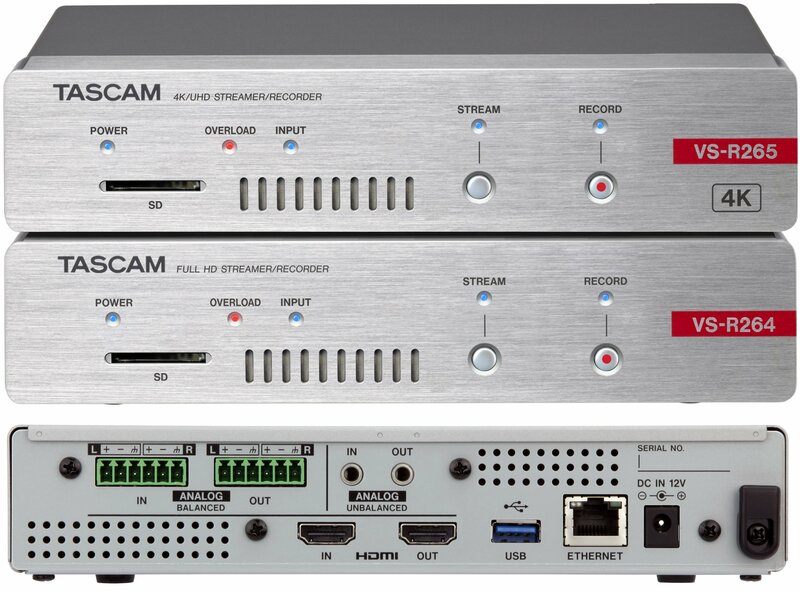 TASCAM VS-R264 & VS-R265: 4K / HD Video Encoding, Streaming, Recording and Decoding devices (bi-directional) in HEVC/H.265 or H.264. With a compact 1U ½ rack size, they can be rack mounted or screwed under a desk, but the attractive styling won’t look out of place on a desktop. Features include simultaneous AV encoding, streaming, recording and decoding over corporate networks and WANs, live streaming via the Internet, plus automatic FTP upload of recorded files to network storage. Utilising open streaming formats and protocols, the VS-R series support CDNs and online live platforms like YouTube, Wowza, Ustream, AWS Elemental MediaLive & CloudFront and others. Whereas many other products either lack professional audio levels or connectors, don’t record at all, or can’t simultaneously encode and decode, TASCAM’s VS-R series sports fully balanced audio I/O via Euroblock connectors, with configurable reference levels for compatibility with professional audio systems. Unbalanced 3.5mm stereo mini jacks are also provided for compatibility with consumer devices. The bi-directional AV operation, live online streaming, secure capture to SD / USB media then later upload for the web site, is ideal for live events, lectures, government sessions, boardroom presentations, concert venues and houses of worship, also for connections between rooms or locations. With power from PoE+ and external 12V DC, HDMI in/out with audio embedding and de-embedding, and full control from a RESTful API allowing for integration into automation/control systems, these units are extremely versatile. 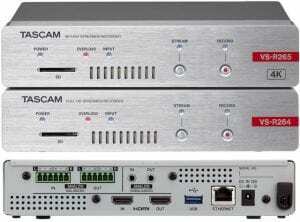 Visit TASCAM at ISE – ISE Booth 14-C120, RAI Amsterdam, www.tascam.eu.